Look for the huge Victorian Gothic hospital. OK, turn round. Veritas’s proprietors Market Town Taverns are getting a reputation for exceptional quality pubs all over the region, so it’s a bit of a surprise they only have this one in Leeds city centre. 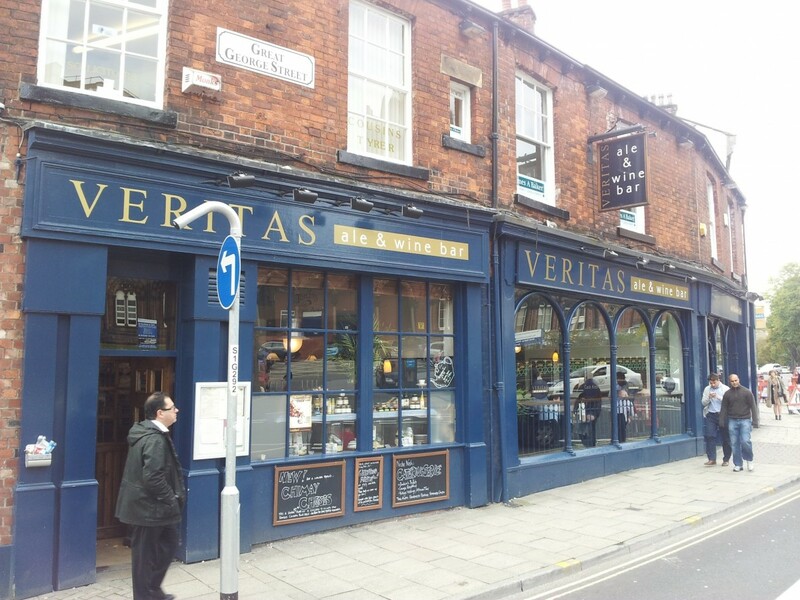 The most obvious word that comes to mind when describing Veritas is peaceful. The decoration and the atmosphere just lend themselves to a comfortable experience, even when it’s really busy. There’s no music or busy televisions: entertainment is provided in the form of today’s newspapers! There are windows everywhere, all looking out on George Gilbert Scott’s amazing LGI building. Really, it’s hard to imagine a city pub with a better atmosphere. The bar. Look at all those ales! 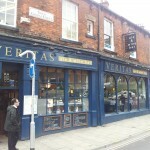 Veritas describes itself as an “ale and wine bar”. I have no idea about the wine, but they’re right about the ale! There are 8 cask ales on at any time, all from different breweries (they had one from the awesome Magic Rock Brewery when we visited). 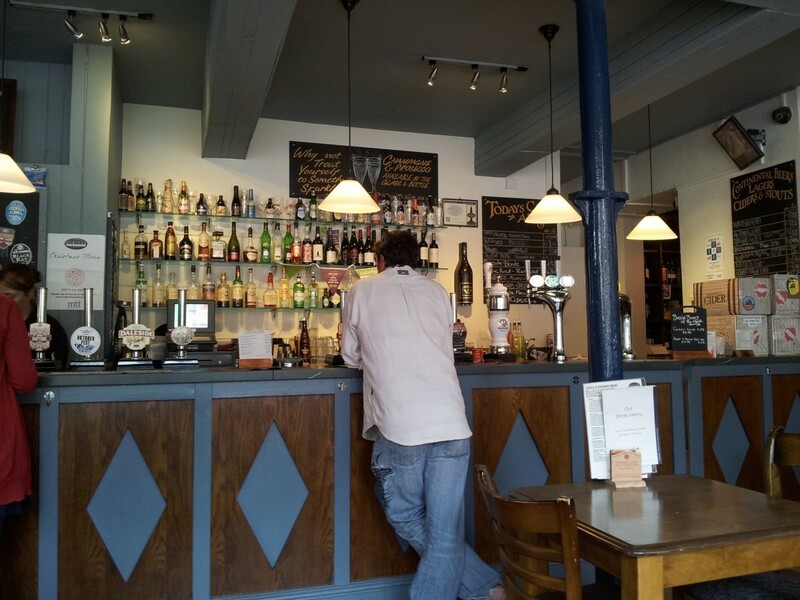 The craft and continental beer selection is really good too, including Punk IPA, Timmerman’s, Ilkley Fortis and various more standard eurolagers on tap, and a great selection of bottles from around the world. 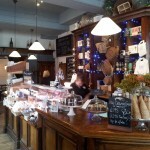 This is the famous deli counter. The only place we’ve seen selling ice cream cones. They also pride themselves on their food, with a large deli counter near the bar and a full menu of lunchtime snacks and modernized tavern classics. The fish & chips here comes not only with mushy peas and tartare sauce, but also tempura prawns and a huge stack of whitebait. Chance of finishing it: zero. We really loved Veritas. It’s got no bells and whistles, and it’s certainly not cheap, but it’s the place to get a great pint and some decent pub food in peaceful surroundings. 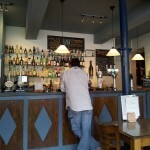 All traditional pubs should be like this! Used to be a “Who-Owns -It-This-Week” wine bar with beer you would run a mile from.I called in January this year and was amazed at the difference.The review is spot on.If you want a good pint with the only noise being people talking,- visit.The food’s good to! 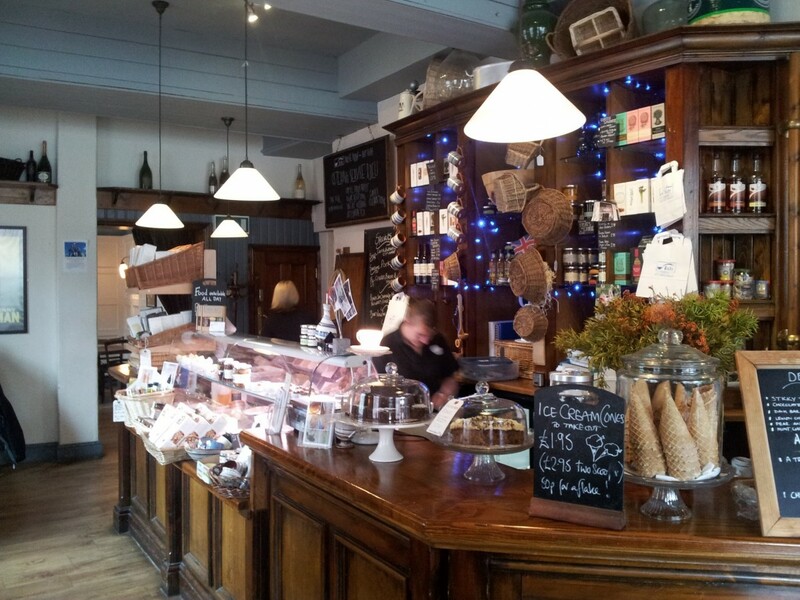 A truly likeable spot with wooden tables and chairs, a nice view out of the window and a deli. It sells some beers you can only get at North Bar but at 75% of the price. Market Town Tavern do a really good balance of world and English ales and haven’t yet fully trodden the dead-end that is the Craft Ale ‘revolution’. A nice place to spend an hour and in the less busy times during the day I would say it’s a ‘bring your laptop’ pub.